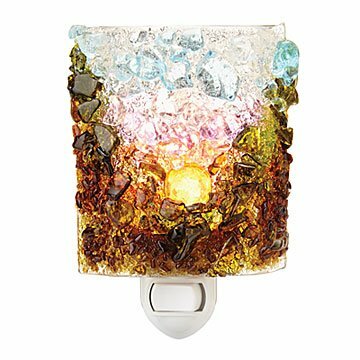 This glass mosaic landscape will get you through the night with the fiery hues of the coming sunrise. In the wee hours before dawn breaks, this glass mosaic landscape will get you through the night with the fiery hues of the coming sunrise. When aglow, the luminescent art piece fills a room with ambient colored light that is bright enough to illuminate obstacles, but soft enough to sleep through. The colorful, textured glass is made from 100% post-consumer bottle glass, kiln formed by artisans Vawn and Mike Gray. Handmade in Cape Coral, Florida. Looks very pretty and does it's job beautifully. This is my 4th night light from the company. I love the designs provided. I use them in the bathroom and hallway at night. Perfect for what I need. Love this nightlight. It lights up my kitchen beautifully at night. All of these night lights are perfect and lovely works of functional art! Absolutely beautiful! I wished I had ordered one for myself! They are beautiful and helpful all at the same time. EVERYONE I gave them to loved them and wanted to know where I had found them. In the process of purchasing more to have for those unexpected gifts or times when I'd just like to bring a smile to someones face. This was a beautiful stocking stuffer for my husband. The clarity of the Mountain sunrise is more distinct in the website image that it is with the actual product. It's still beautiful, but it is not obvious what it is. It was a gift and shipped directly. I hear the colors are gorgeous!